So the cold, cruel North Wind may blow, but sure isn’t stopping bands coming from the balmier parts of the country to play in NYC. Washington State may not be particularly balmy right now, but it is quite a distance for the folk darling Brandi Carlile to come to play just for you. This Wednesday, the 3rd, she’ll be performing a sold out show at Ridgefield Playhouse. If you don’t have tickets, try to find some online, because she’s an extremely powerful singer. Check out this weird but fun video for her latest hit “Dreams” off her third album Give Up the Ghost. On second review, the video is a little creepy – mostly because she sings half of the song with her eyes closed, lying down in the crook of a willow tree. But we’ll let it slide because it’s such a strong song. Giveaway! Head over to the Listener Advisory Board right now to win some tickets to see the supergroup Them Crooked Vultures at the Roseland Ballroom on February 8th. You can read about them in this post from last November. They’ll be playing that and other songs of Ode to Sunshine, hopefully in addition to a few sneak peeks off of their upcoming record, History from Below, due out in May. 13th and 14th he’s relocating to the Bowery Ballroom. The reason he’s selling out all of these shows is that on Tuesday he’s releasing his third album The Rainwater LP, especially important since the now brooklyn-based artist hasn’t released anything since his Clarence Greenwood Recordings in 2004. That’s a jam-packed week, because just before Citizen Cope gets to the Ballroom, the Aussie John Butler Trio will be headlining there. They’ve got an album coming out soon too; April Rising, the band’s fifth. Then on the 16th, after Mr. Cope clears out, Phish’s Trey Anastasio will be taking over Bowery Ballroom. He’s hitting the road again starting on the 8th in Virginia with his “Classic Trey Anastasio Band (TAB)”. He says he’ll be trying out some new songs – in his words, TAB “is sort of a breeding ground for Phish material”. You can check out the interview with him that I was reading here. Now you may be reading this and thinking to yourself “Gee, how did I not know that Bowery Ballroom was such a groovy place? Why don’t I go there all the time?” And the answer is because if you just go to Bowery Ballroom then you would miss Eric Clapton coming to Madison Square Garden! That’s right, Thursday and Friday, February 18th and 19th Eric Clapton will be playing two shows at the Knicks’ home, with long time fellow guitarist Jeff Beck. Beck just yesterday won a Grammy for Best Rock Instrumental Performance for his work on “A Day In The Life” off of his 2009 Performing This Week…Live At Ronnie Scott’s. This makes him a five-time Grammy winner, which is also how many Grammys Beyonce won last night. 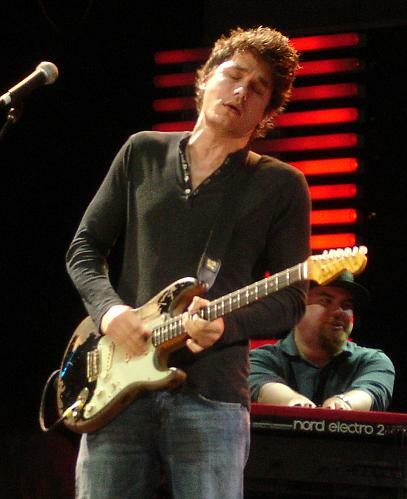 If that’s not enough stardom for you, John Mayer will be playing on the 25th and 26th, with guest Michael Franti on the “Battle Studies Tour”. Everyone knows John Mayer now, and a growing number of people know Mr. Franti through his super catchy song “Say Hey” off of 2008’s All Rebel Rockers. Finally, don’t miss Umphrey’s McGee coming to Nokia Theater on the 25th also. They played last year at Summerstage in Central Park, and it was a really fun show. If you’re thinking about going, practice your “U” hand signs well in advance. Phew! Well happy concert hunting in New York’s back yard – and don’t let these winter blues get you down.